“With so many travelers arriving to Victoria’s Inner Harbour on foot via float plane or ferry, we’re thrilled our hotel is able to offer them this easy, cost effective and green way to explore our city,” said Francis Mairet, principal, Mairet Hotels. Hotel guests can now reserve their car with their room for a fun, convenient and affordable way to explore the city. Within 24 hours of arrival, guests can easily book direct through the hotel’s website or by calling reservations (1-800-774-1500) and asking for the MY STAY. MY CAR.™ package. With 4 cars in inventory, guests have the choice to select the all-electric SOLO car ($20) or Toyota Prius hybrid ($30) with their hotel stay. When the guest arrives, they complete a one-page rental agreement, check-in, and are provided with two keys for their stay: their room and their car. The program is powered by share economy pioneer, Turo. As many of Victoria’s attractions are outside of the downtown core, having a car allows travelers to easily access popular locations such as Victoria’s Butchart Gardens or Willows Beach. 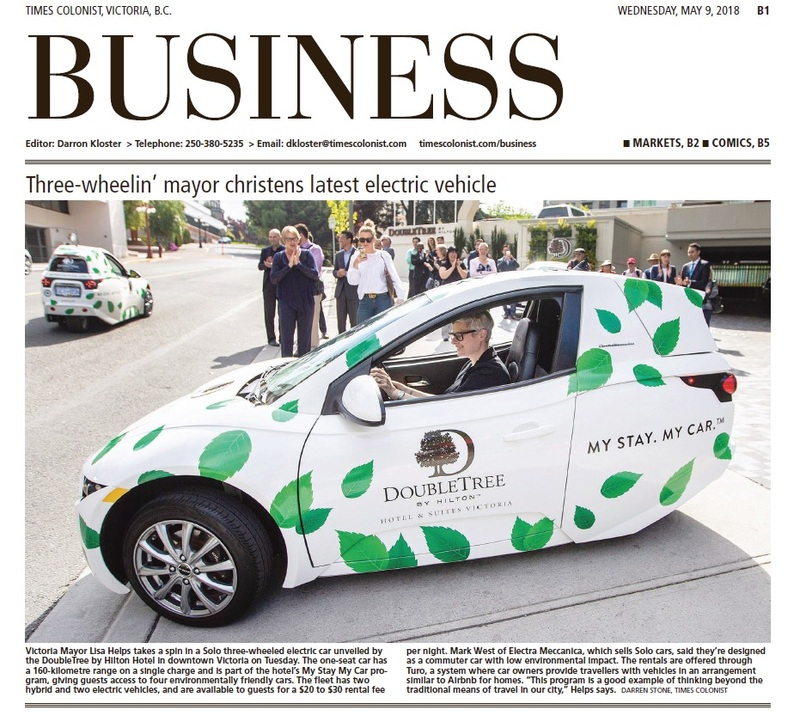 The DoubleTree by Hilton Hotel & Suites Victoria was the first hotel to offer a car share service via the Turo platform. About Turo: Turo is a car sharing marketplace where local car owners provide travelers with the perfect vehicle for their next adventure. Travelers from around the world choose from a unique selection of cars and car owners earn extra money while helping fuel their adventures. A pioneer of the sharing economy and travel industry, Turo is a safe, supportive community where the car you rent is part of a story, not a fleet. Whether it’s an F-150 truck to help out on moving day, a Tesla for a luxurious weekend away, or a classic Mercedes-Benz for a picture-perfect road trip, travelers rent the car and own the adventure. Discover Turo at Turo.com.